How did you get to your school(s) through high school? The timing for this topic couldn't have been better. My husband and I were just talking about the schools we attended in our respective towns. I thought it strange that I attended two schools twice during different years. I lived in the village of Mineral Ridge my whole life. 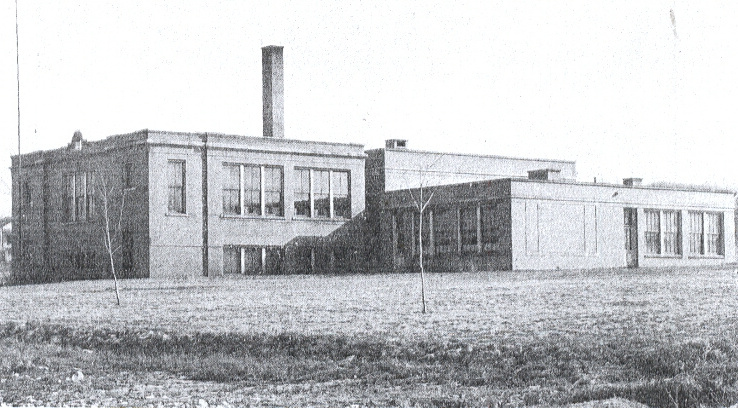 Because the Ridge was too small to have a city school, the local school was part of the Weathersfield Township Local School District in Trumbull County, Ohio. The school I first attended, Mineral Ridge School, included all grades and was in the center of Mineral Ridge. The children and teens who lived in the Ridge walked to school (and the students who lived in other parts of the township arrived by bus). If there hadn't been buildings in the way, I could have seen the school from my front porch. Our house was the second on the north side of Furnace Street, so I walked up Furnace Street toward Main, turned left to walk past the Methodist Church, crossed Morris Street, passed Isaly's Dairy (all to my left as I walked), crossed Main Street, and I was at school. I attended Mineral Ridge School through third grade. I assume Mineral Ridge and the township had an increase in students because a new elementary school was being built but it wasn't ready by the time we began fourth grade. For the first part of fourth grade I went to Evansville School, another township school not too far away. To arrive there I first walked to Mineral Ridge School, then boarded a school bus and traveled the several miles to Evansville School. Sometime in the middle of fourth grade the new Seaborn Elementary School was completed and we began attending that school after Christmas holiday. Once again I had to walk to (what was now called) Mineral Ridge High School to catch the bus to the new elementary school. Seaborn was probably less than a mile from my home, not far from the end of Furnace Street, but I suppose farmers didn't want us walking through their fields to take the direct route. Neither did our moms, I'm sure. Hence, we rode the school bus. For seventh and eighth grades we returned to Evansville School and, again, rode the bus. From ninth through twelfth grades I attended Mineral Ridge High School and I walked to and from school. All of the schools I attended from first through twelfth grade, from 1956 to 1968, have been demolished. Seaborn Elementary survived less than 60 years. It's sad that all your schools have been torn down. My first elementary school is over 100 years old and still has students walking the same halls and classrooms that I walked decades ago. That's wonderful that your schools still stand and are in use, Linda. I love the old buildings and wish ours had survived to old age. I rode the bus to school until I was was old enough to drive - then I drove myself. I love topics like that when I'm adding to my online family journal. I will have to answer that one myself, since I don't think it's a topic I've addressed. How interesting to live in the same house and go to so many different schools. I guess the one good thing was that all your friends were doing the same! This isn't a topic I would have thought to add to a family history, Susan, but it adds interest. It's true about my friends. We began first grade together and graduated from high school together. We weren't always in the same classrooms from one year to the next but we all knew each other. A few students moved away during those years, and a few news ones arrived, but generally we were all together those twelve years. I walked to elementary, junior high and high school. By today’s standards, I should have been eligible for a bus ride to the high school. Backpacks had not been invented, so we carried a stack of books and notebooks daily. Plus we crossed a highway with no crossing guard. We should have died but we didn’t! I remember carrying armloads of books and notebooks to and from school, Wendy. How did we not end up with stooped shoulders? I think all the walking made us healthier than some young students these days. And no crossing guards made us careful to watch for traffic. We were strong!